Miraculous: Tales of Ladybug and Cat Noir is a French animated TV series by Thomas Astruc and ZAG Animation, which premiered in 2015. 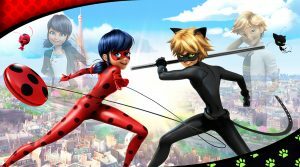 It tells the story of two high school kids in Paris, Marinette and Adrien, who inherit the powers of Ladybug and Cat Noir — charged with defeating the evil spirits that turn ordinary people into dangerous criminals. Each of them has joined up with a Kwami, a good magical spirit who transforms them into their super-selves for a limited time. The series was dubbed in English and it’s been running on Nickelodeon in North America — as well as released on DVD by Shout! Factory. What’s more, now Action Lab have now produced a new full-color Miraculous comic book series.